Arranging the delicate fragrance of Almond all year round and its subtle flavors, it's possible! Our Natural Almond flavoring is perfectly suited to the incorporation of this unique flavor, both in salty recipes and in many desserts. Its delicate and delicate touch, easily recognizable, is always appreciated because it recalls memories of childhood. Sing your guests' taste buds by adding a little Natural Almond flavoring to a blue cheese sauce, a meat or vegetable stuffing or a verrine: it will surprise you where you do not expect it at all, For the pleasure of your guests! The unique taste of Almond sublimates green vegetables such as zucchini, cabbage, broccoli and beans. The Natural Almond Flavor blends so easily with delicacies and sweets! But it is also very comfortable in preparations as diverse as a jam, a jelly or a compote, and why not an ice cream or white cheese with a fruit coulis. A hint of this flavoring in a cafe, and you will not get over it. The Natural Almond flavoring sublimates all the classic almond recipes: frangipane of course, but also disguised fruits (dates and chestnuts, cakes of kings, financiers). Note that the Natural Flavor of Almond differs from the essential oil of bitter almond which, as well as provided a certificate of food, can wonderfully perfume your pastries. The Almond flavoring offers some dishes an unrivaled touch of refinement. In traditional dishes such as tajines, the association is simply delicious. 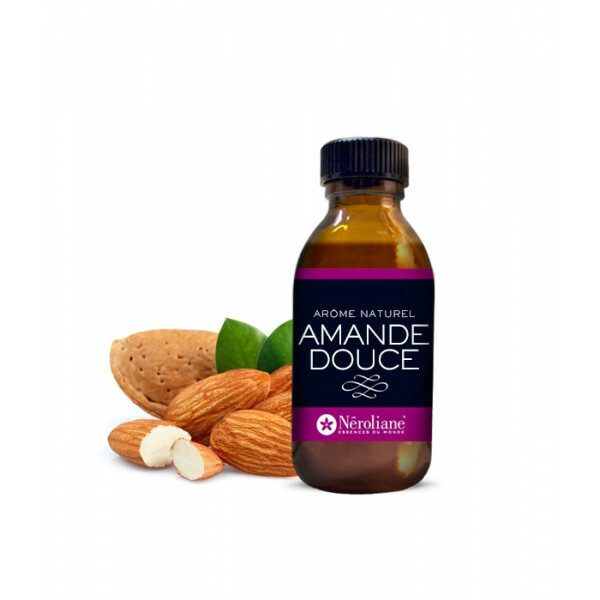 The Almond Flavour blends harmoniously with all kinds of dishes: do not hesitate and be creative, especially with your fish dishes or even, your soups! And remember that she is not opposed to participating in an exotic recipe. SUGGESTION OF USE : from 1 drop per plate to 1 coffee spoon of Natural Almond flavoring per preperation liter. Those few drop should be enough to reveal the full taste of Almond. REGULATIONS : Natural flavoring of vegetable origin obtained by extraction, concentration, distillation, roasting or fermentation in accordance with European legislation. Designed with respect for men and the environment, the products of Neroliane restore the authentic flavors for a kitchen in the air of time.